The Win32 User Interface MDG Technology provides the tools to help you design a user interface that closely emulates the visual style and available options for Windows dialogs. These user interface components are supported, each matching the equivalent-named RC resource. The equivalent of the RC format DIALOG and DIALOGEX resources. The equivalent of the RC format LTEXT, RTEXT, CTEXT resources. The equivalent of the RC format EDITTEXT resource. The equivalent of the RC format BUTTON, DEFPUSHBUTTON and other resources. The equivalent of the RC format CHECKBOX resource. The equivalent of the RC format SCROLLBAR resource with SBS_VERT style. The equivalent of the RC format GROUPBOX resource. The equivalent of the RC format COMBOBOX resource. Note: When you initially drag the 'Combo Box' icon - of type 'Drop Down' or 'Drop Down List' - onto a diagram, the middle 'tracking handle' on each side of the element is white, indicating that you can only adjust the width of the element. To adjust the height of the element as well as the width, click on the drop-down arrow part of the image; the middle 'tracking handle' on the bottom edge is now white, indicating that you can drag the base down to set the virtual height (the height of the element when it is expanded to show all possible values in the drop-down list). 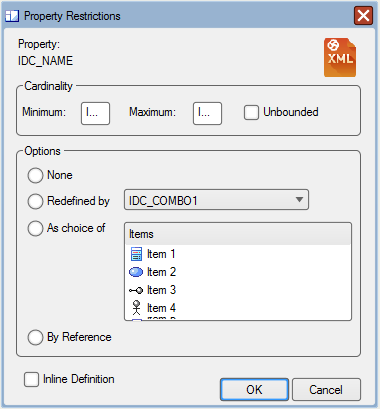 The equivalent of the RC format LISTBOX resource. The equivalent of the RC format RADIOBUTTON resource. The equivalent of the RC format TABPANE resource. The equivalent of the RC format STATIC resource with SS_BITMAP style. The control can render an image when applied from your model. An image can be applied by selecting it first and pressing Ctrl+Shift+W to display the Image Manager. Afterwards, you might need to change the value of the resource ID in the appropriate Tagged Value. The equivalent of the RC format CONTROL resource.